Photodynamic therapy involves applying a photosensitizing agent such as Aminolevulinic acid (ALA) to the face for about an hour and then using a light treatment to activate it. 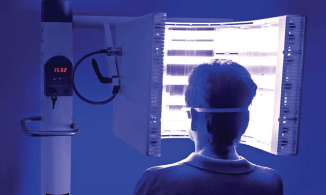 SipersteinDermatology offers blue light therapy which is a type of photodynamic therapy approved to treat premalignant skin lesions and some superficial skin cancers.This treatment can help with anything from acne to precancers called actinic keratosis, and needs to be done under the supervision of a physician. This procedure is performed in the office. First, a light-sensitizing liquid (photosensitizer) is applied to the skin. There is an incubation period ranging from 30 minutes to 4 hours. Finally, the target tissue is then exposed to a specific wavelength of light (either blue light or pulsed dye laser) that then activates the photosensitizing medication. After this treatment it will feel as if you had a sunburn and the precancerous lesions will start to crust and flake off over one week. Several treatments may be needed, though on average, each treatment removes 70-85% of visible precancers.